"The men employed on the water carts work according to the state of the weather. Thus, in summer under a hot dry wind, they emerge at early morning from the vestry yards and radiate over the parishes. During wet weather some are employed in cleansing the roads, others in carting materials for the contractors who supply the building trade. These are the hands who find constant employment under one master at weekly wages ranging from eighteen to twenty-three shillings. In justice to the contractors, I must express my admiration of the carts, men, and horses used in this branch of road labour. 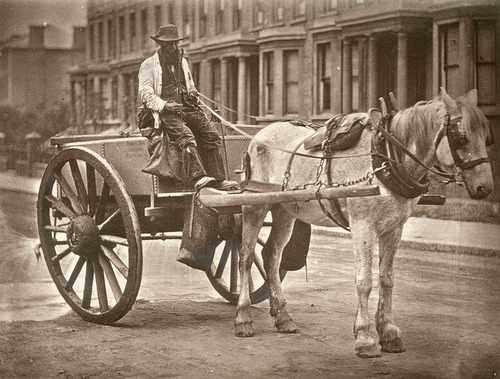 "The accompanying illustration is a fair specimen of the modern water-cart and its accessories. The cart is, I believe, protected by a patent, and is assuredly of the most novel construction. The horse is typical of the class of animal used for the work - large and powerful, so as to stand the strain of incessant journeyings two and fro, and of the weight of water in the tank. The man is a fair type of his class, being attired in a manner peculiar to watering-men. Beyond the ability to groom and manage a well-fed docile horse, nothing approaching skilled labour is required. He sits on his perch all day long, only descending when it is necessary to refill his cart at the hydrants."